In June 2006 the new Basin Butte wolf pack killed a cow calf near Cow Camp road north of Stanley, Idaho. I didn’t give it much of a chance; but today it consists of 3 adult wolves, 4 yearlings (5 until the other day) and 5 new pups. It has left the numerous summertime sheep and cattle in the area alone, and has been a source of great pleasure for many local folks near Stanley and elsewhere. 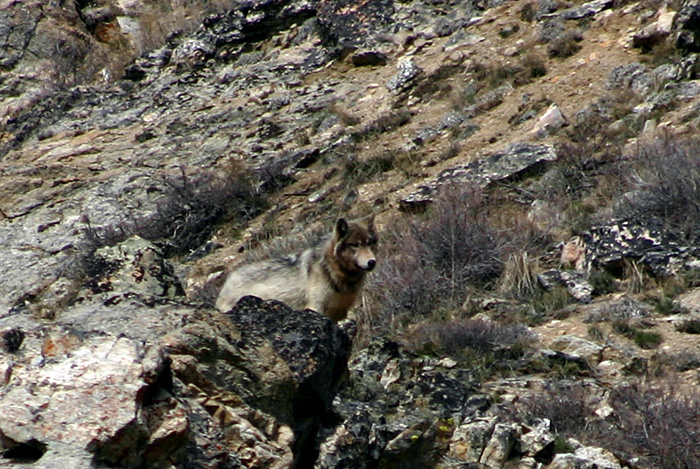 The pack begin in the late winter of 2005 when a dispersing female wolf from the Galena Pack to the south and a big male from parts unknown got together. Sometime later they were joined by another male who is today referred to by locals as “the uncle.” In April 2006 they had a litter of 5 pups somewhere near Basin Butte, a prominent ridge (but not noticed by most tourists) on the east side of Valley Creek. Tourists are looking at the Sawtooths to the west. I learned about this well behaved pack, doing what it should — eating ground squirrels, killing elk (but not livestock) and eating the abundant road kill — by reading stories in the Idaho Statesman, Mountain Express, reports by Ed Bangs, a local resident of Cow Camp road area, the Western Watersheds Project, and Scott Bragoner of USFWS Law Enforcement. Despite the grumblings of local anti-wolf activists Ron Gillet and a few of his pals and ranchers, I sense a growing level of support among Stanley residents. A resident of Cow Camp road described how pleased he and his spouse were when the pack killed an elk on their property and they were able to watch it slowly disappear as the wolves dismantled all of it except the stomach, which they strictly avoided (but other scavengers took it). Apparently numerous residents are looking out for the pack and scaring them off if they are near cattle. This type of community effort could represent a bright spot in a state where the governor and the Fish and Game Commission hold attitudes that should have died off decades ago. Amazingly the only mortality the pack has suffered was the other day when “range rider” George Gilbert illegally shot a yearling female who (according to the federal complaint) was minding her business. Gilbert has been charged with a class B offense. Although it hasn’t been adjudicated, Scott Bragoner of USFWS in Idaho Falls told me the likely outcome would be a $275 fine. With thousands of cattle pouring into the area, and soon sheep, which will turn the beautiful meadows to dust by the end of the summer, let’s hope the good luck of this pack will continue. Wolf 313F, “Angel.” Photo courtesy of Lynne Stone. Copyright. 313F was illegally shot. Braggoner told me for it to be class A, the shooting would have to have included some aggrevating circumstances. getting nothing more than a slap on the wrist. From what I’ve heard, this pack really likes to hunt those big fat columbian ground squirrels (shades of Farley Mowat!). Of course, with the drying of the meadows, that kind of hunting is now done for this year. But I think the wolf might have passed through some cattle on her way to going squirrel hunting. Actually, a wolf passing through cattle and ignoring them is very good wolf behavior. The wolf was shot on her return. Perhaps (just a guess) the shooter thought she had chased cattle. This is the picture I got, at least, from talking with local residents. Sorry to harp on this but this really pisses me off. He “thought” she was chasing cattle. In my opinion this is no different than the guy who shot a grizzly because he “thought” it was a black bear ot the guy that shoots a moose because he “thought” it was an elk. Don’t they have to catch them in the act of harassing livestock before they can shoot? Yes, they have to catch them chasing cattle. That’s why he was cited. The wolf wasn’t chasing cattle. How wonderful to see people and wolves living in harmony, except for the death of 1 wolf, it’s amazing that this is really happening. I hpe it will continue in the future. It is a split community, but I sense a lot folks are no longer satisfied with a handful of ranchers (most of whom do not live in the area year round) determining community policy. One good example was the recent election of a woman in her early 20s as mayor of Stanley. I heard that she siimply walked by a herd of cows and then went up onto public land where a rancher type followed and shot her. It really is outrageous that he got off so easily. I am astonished that wolves are able to pack in that area at all. Predator habitat is not very welcomed in the state where I live. It is a very fine line between rancher and animal in South Dakota and it is often crossed. It is uplifting to read about the lives of these wolves and knowing the fights we face here over mountain lions, I empathize with those who feel like they are loosing the battle for wildlife! The thing to remember is that we only lose the battle if we stop fighting. I agree with those who are tired of seeing those who illegally shoot wildlife punished with nothing more than a slap on the wrist. Last I knew, laws and their accompanying punishments were ment to -deter- this kind of careless, criminal activity. Webmaster note: the email address from this post is baby.boo.3721@hotmail.com I think it’s more likely an adult with the intelligence of an unpleasant 13-year old.